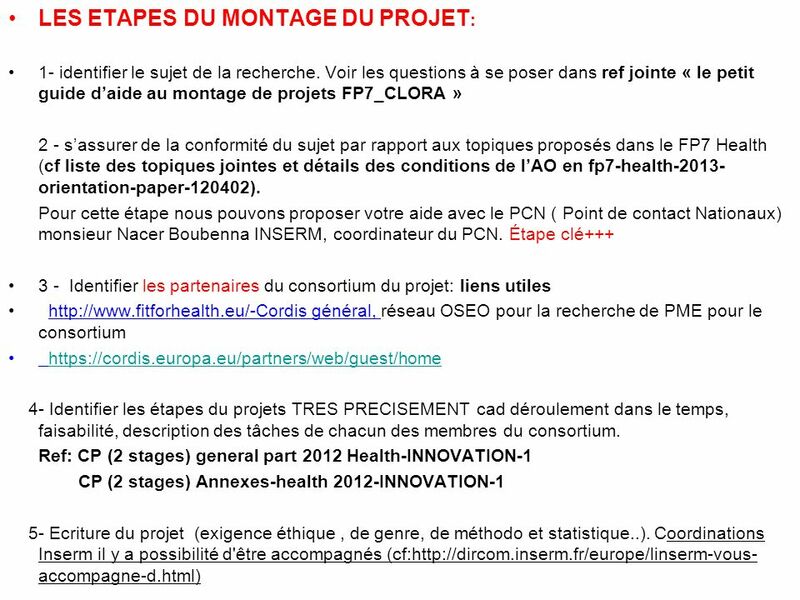 APPEL A PROJET EUROPEEN « FP7-HEALTH-2013-innovation-1 FP7-HEALTH-2013-innovation-2 » PROJETS COLLABORATIFS. 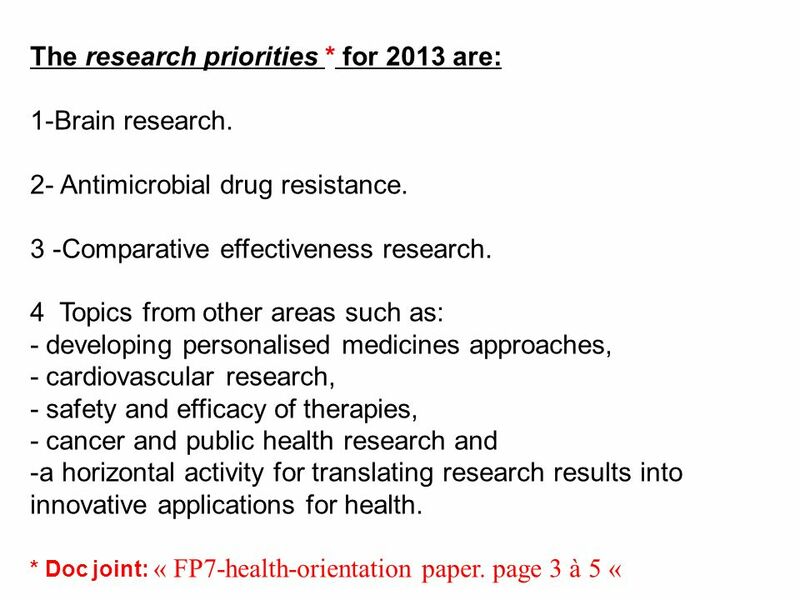 3 The research priorities * for 2013 are: 1-Brain research. B- Dossier constitué deux parties: « Part A » et « Part B »: Part 1 and Part 2 sont à renseigner a STAGE1 and STAGE2 of the proposal Part A : administration details that will be used in the evaluation and further processiong of your proposal. 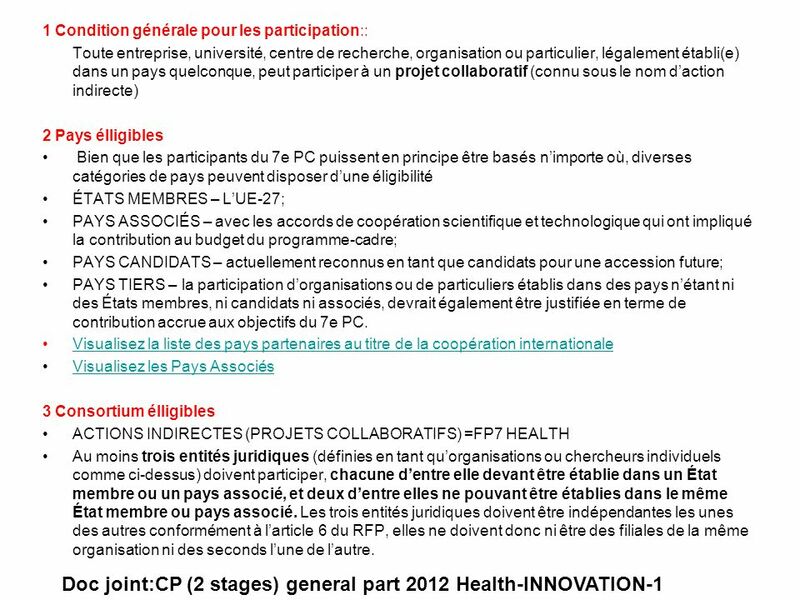 * cf CP(2 stages) Annexes-health 2012-INNOVATION-1 annex 3 page 14 à 23 PART B : detail of your work you attend to carry . 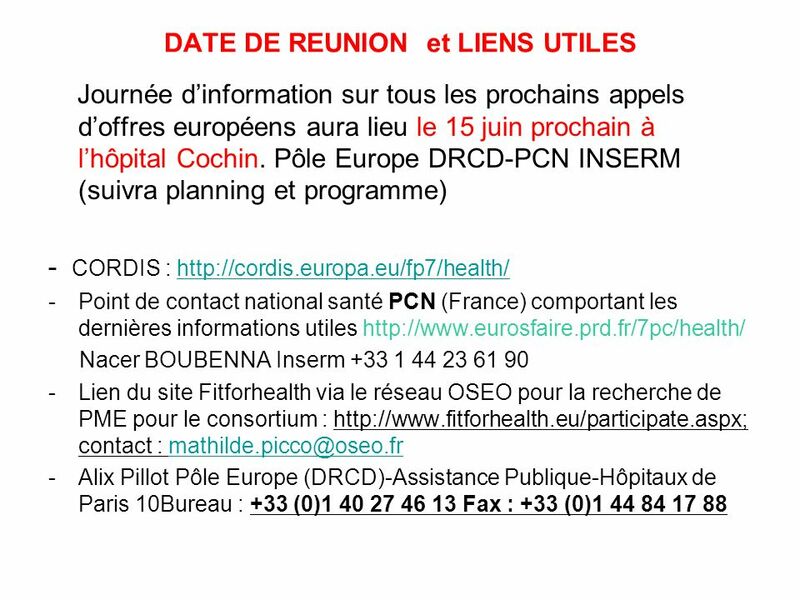 * cf Annexes-health 2012-INNOVATION-1 annex 4 page 24 à 46 Theme specific information (1) Publication of call call 20 July 2012 ? 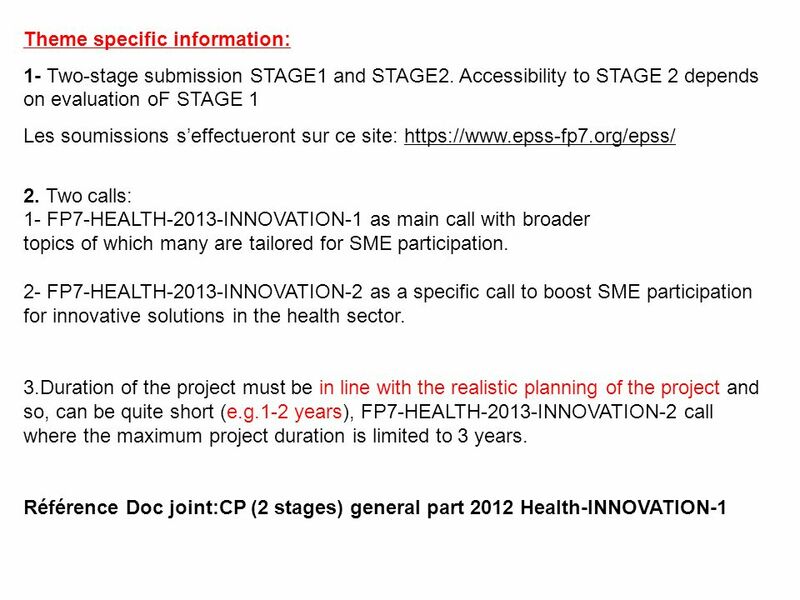 Deadline for submission of stage 1 proposals INNOVATION-1: 2 October 2011, ? INNOVATION-2: 25 septembre ? 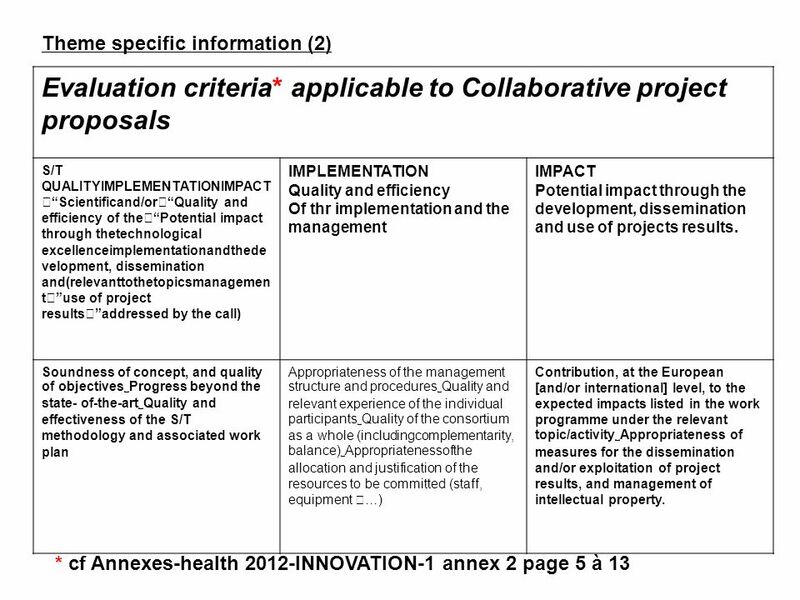 Evaluation of stage one proposals Decembre2012 ? 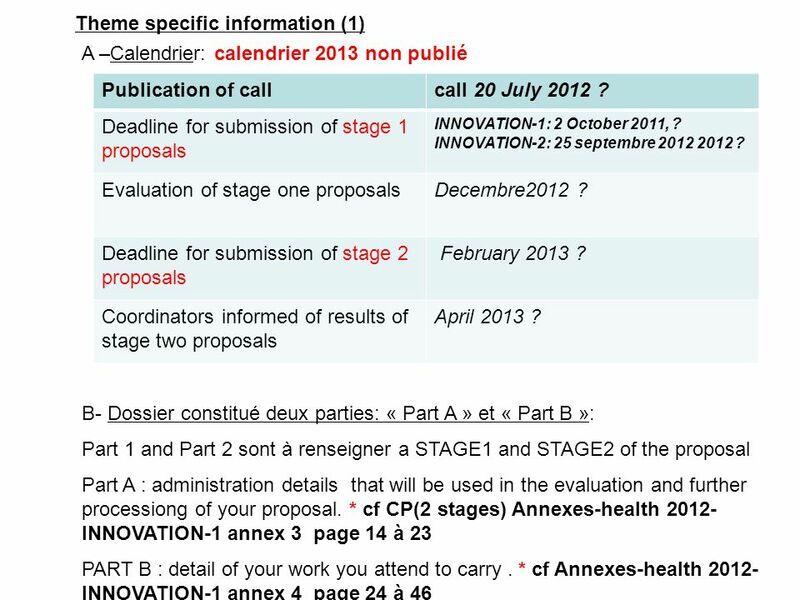 Deadline for submission of stage 2 proposals February 2013 ? Coordinators informed of results of stage two proposals April 2013 ? 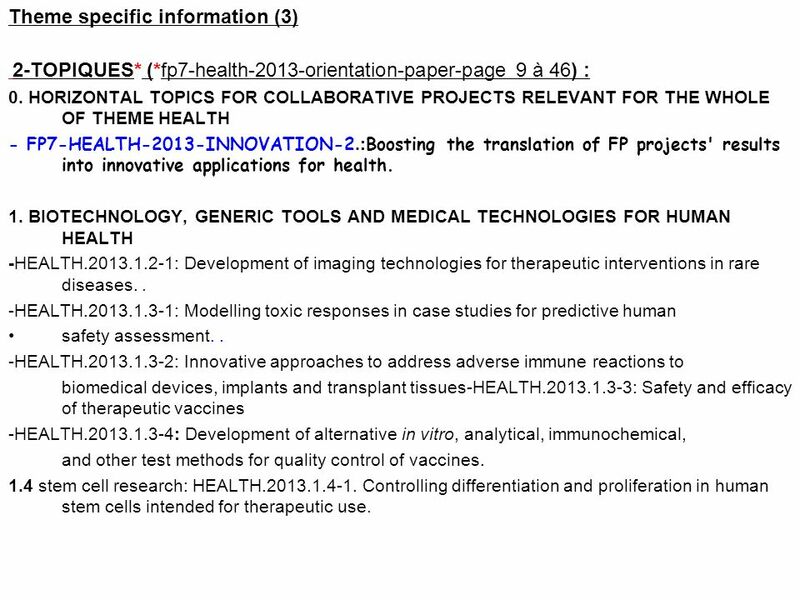 2-TOPIQUES* (*fp7-health-2013-orientation-paper-page 9 à 46) : 0. 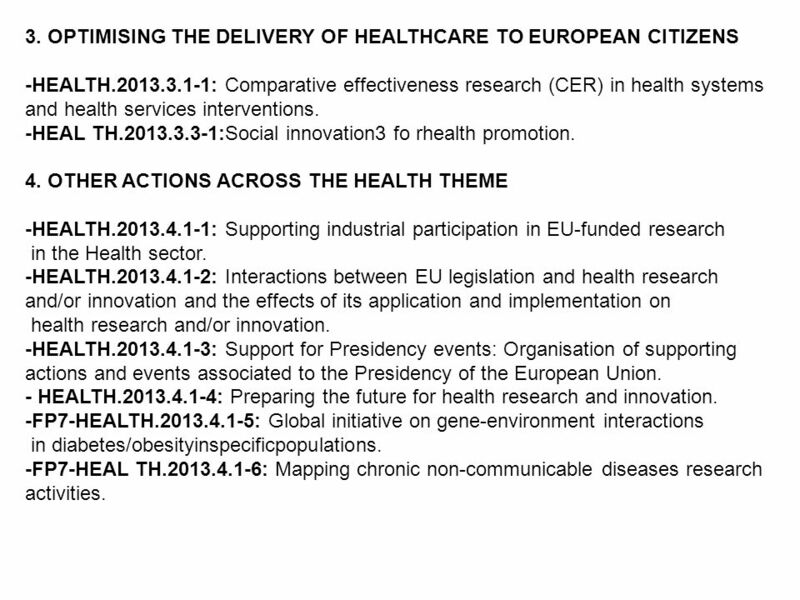 HORIZONTAL TOPICS FOR COLLABORATIVE PROJECTS RELEVANT FOR THE WHOLE OF THEME HEALTH - FP7-HEALTH-2013-INNOVATION-2. 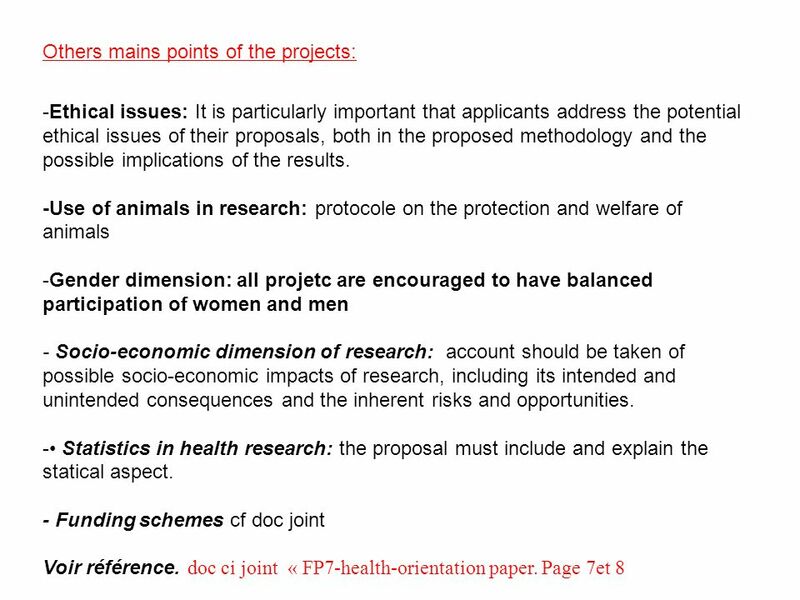 :Boosting the translation of FP projects' results into innovative applications for health. 1. BIOTECHNOLOGY, GENERIC TOOLS AND MEDICAL TECHNOLOGIES FOR HUMAN HEALTH -HEALTH : Development of imaging technologies for therapeutic interventions in rare diseases. . -HEALTH : Modelling toxic responses in case studies for predictive human safety assessment. . -HEALTH : Innovative approaches to address adverse immune reactions to biomedical devices, implants and transplant tissues-HEALTH : Safety and efficacy of therapeutic vaccines -HEALTH : Development of alternative in vitro, analytical, immunochemical, and other test methods for quality control of vaccines. 1.4 stem cell research: HEALTH Controlling differentiation and proliferation in human stem cells intended for therapeutic use. 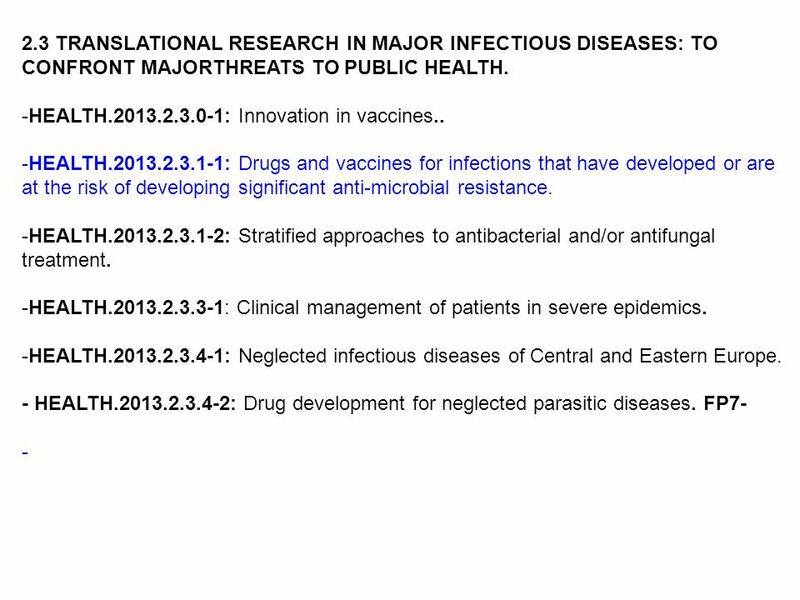 11 2.3 TRANSLATIONAL RESEARCH IN MAJOR INFECTIOUS DISEASES: TO CONFRONT MAJORTHREATS TO PUBLIC HEALTH. -HEALTH : Comparative effectiveness research (CER) in health systems and health services interventions. -HEAL TH :Social innovation3 fo rhealth promotion. 4. 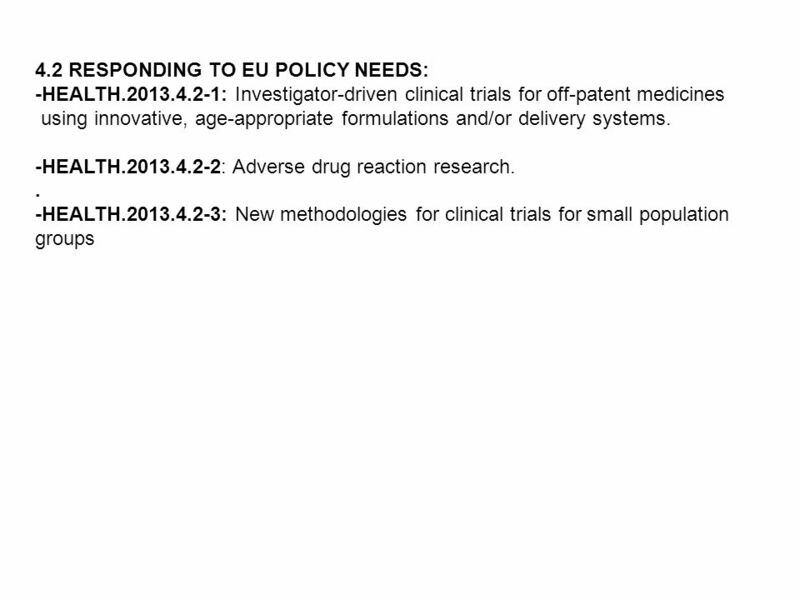 OTHER ACTIONS ACROSS THE HEALTH THEME -HEALTH : Supporting industrial participation in EU-funded research in the Health sector. 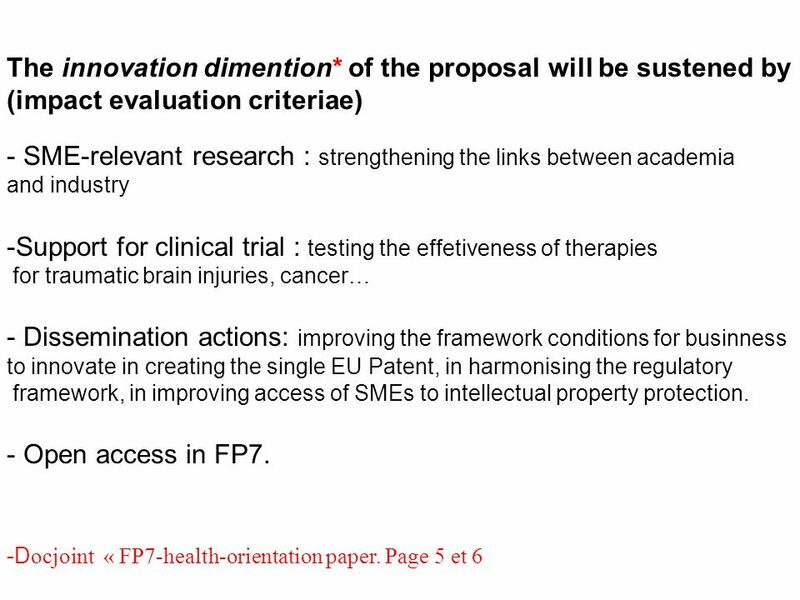 -HEALTH : Interactions between EU legislation and health research and/or innovation and the effects of its application and implementation on health research and/or innovation. 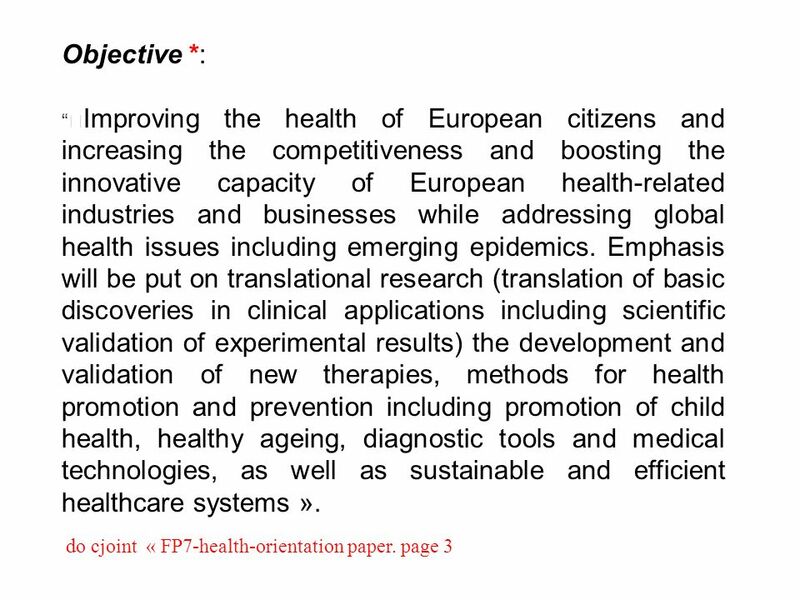 -HEALTH : Support for Presidency events: Organisation of supporting actions and events associated to the Presidency of the European Union. 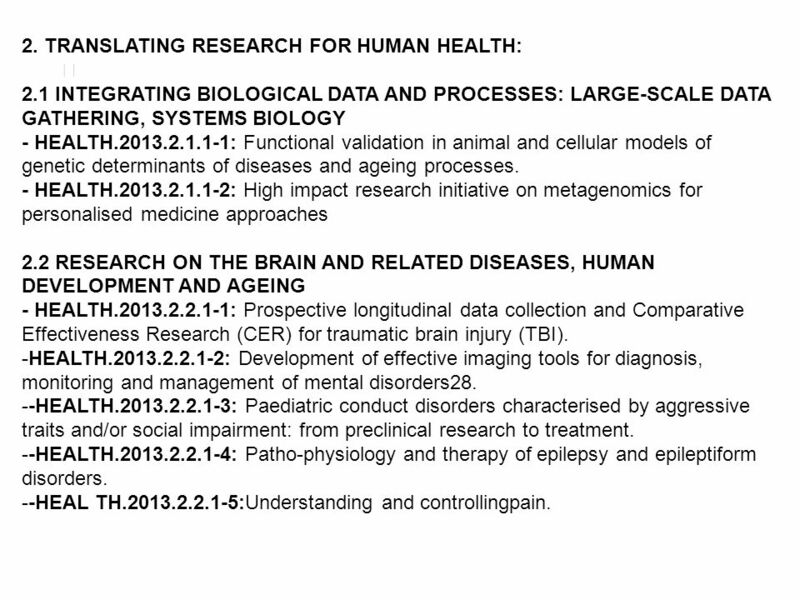 - HEALTH : Preparing the future for health research and innovation. -FP7-HEALTH : Global initiative on gene-environment interactions in diabetes/obesityinspecificpopulations. 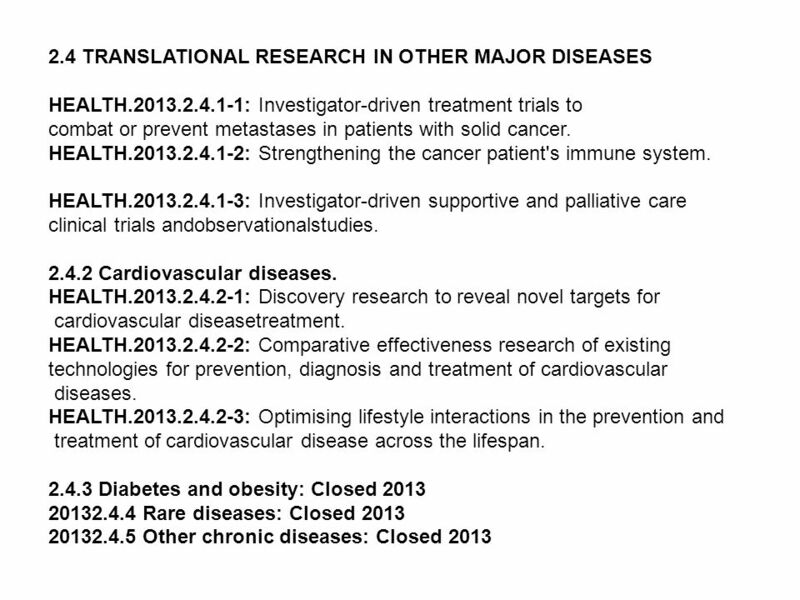 -FP7-HEAL TH : Mapping chronic non-communicable diseases research activities. 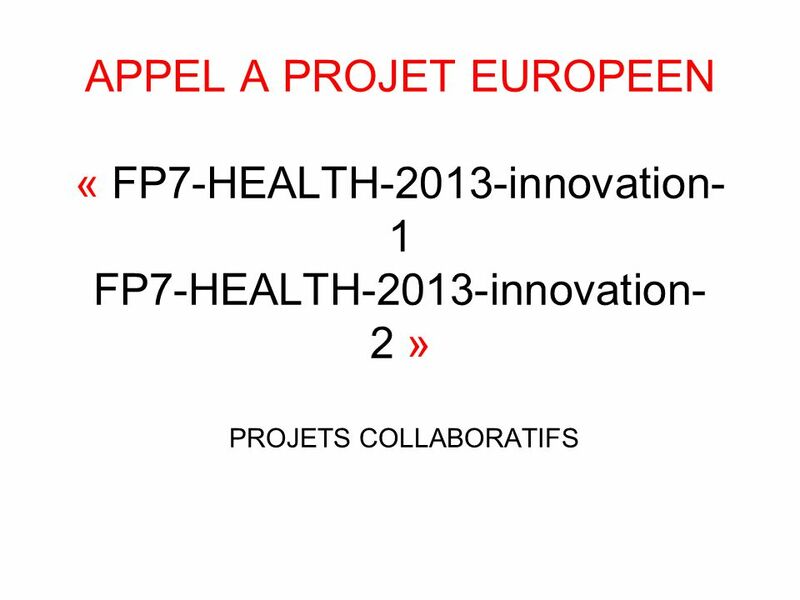 Télécharger ppt "APPEL A PROJET EUROPEEN « FP7-HEALTH-2013-innovation-1 FP7-HEALTH-2013-innovation-2 » PROJETS COLLABORATIFS." 1 DGRI / Département des affaires européennes et internationales 7 ème PCRDT, TIC: appel SME Initiative on Digital Content and Languages Frédéric Laurent.